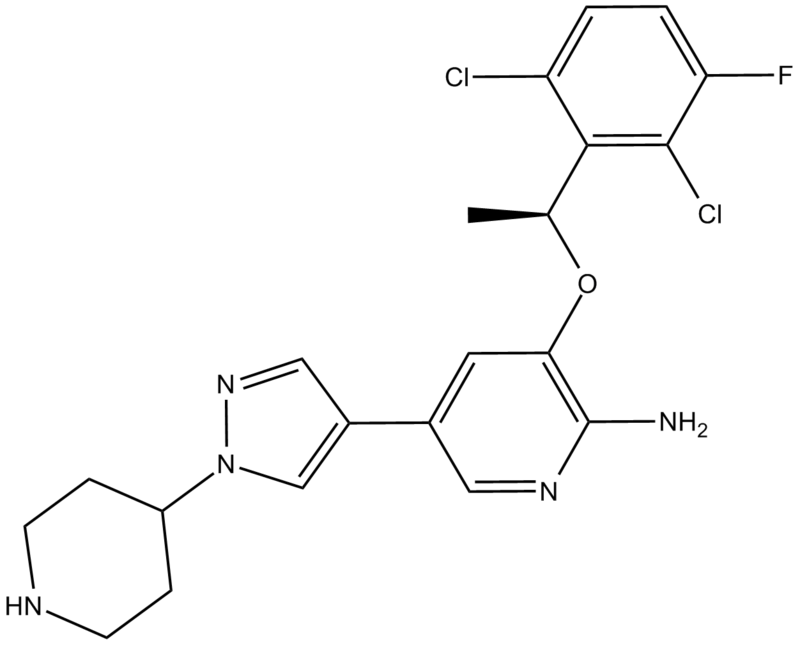 Description (S)-crizotinib, the (S)-enantiomer of crizotinib, is a potent inhibitor of the human mutT homologue MTH1 (NUDT1) with an IC50 value of 72 nM. (S)-crizotinibthe selectively inhibited MTH1 catalytic activity with IC50 of 72 nM, while clinically used (R)-enantiomer of the drug was inactive with IC50 of 1375 nM. Furthermore, direct-binding assays (ITC) indicated a 16-fold higher affinity of the (S)-enantiomer towards MTH1 compared with (R)-enantiomer. By using Km concentrations of substrates, the average IC50 values for (S)-crizotinib and the MTH1 substrates 8-oxo-dGTP and 2-OH-dATP were 330 nM and 408 nM respectively. 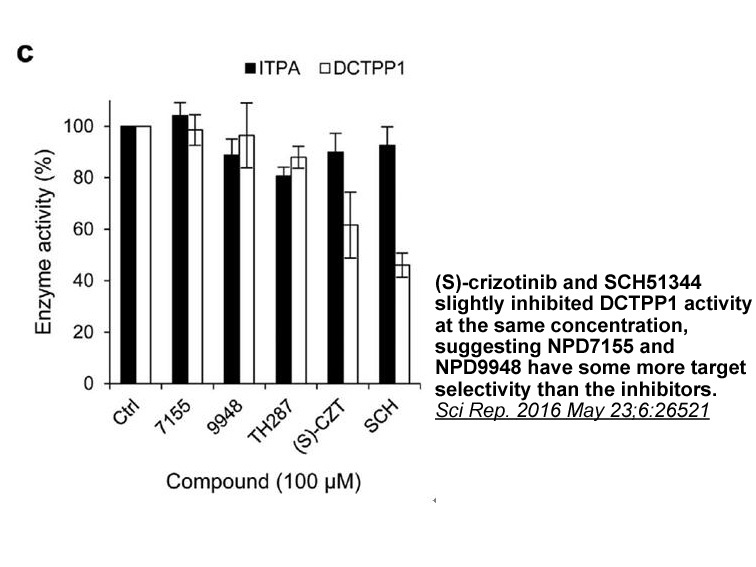 (S)-crizotinib efficiently inhibited colony formation of SW480 cells andKRAS-mutated PANC1 cells, similar to SCH51344. In addition, in vitro Kd measurements indicated that (S)-crizotinib was considerably less potent than the (R)-enantiomer against the established targets ALK,MET and ROS1. 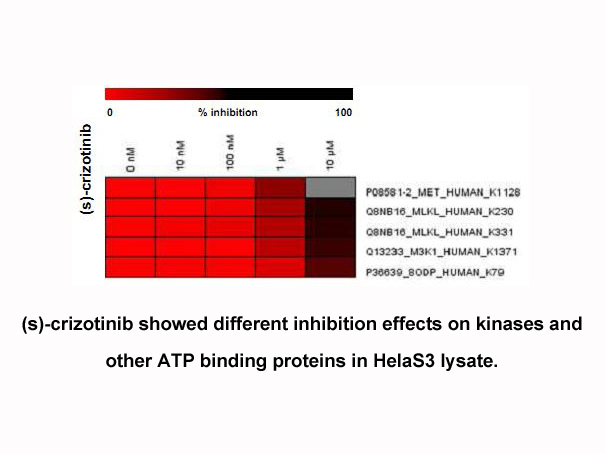 (S)-crizotinib did not lead to the detection of any significant effects on proliferation in SW480 cells and showed highest toxicity towards the SV40T and KRASV12 cells. (S)-crizotinib, in contrast to (R)-crizotinib, efficiently stabilized MTH1 validating the differential targeting within BJ-KRASV12 cells using a cellular thermal shift assay. 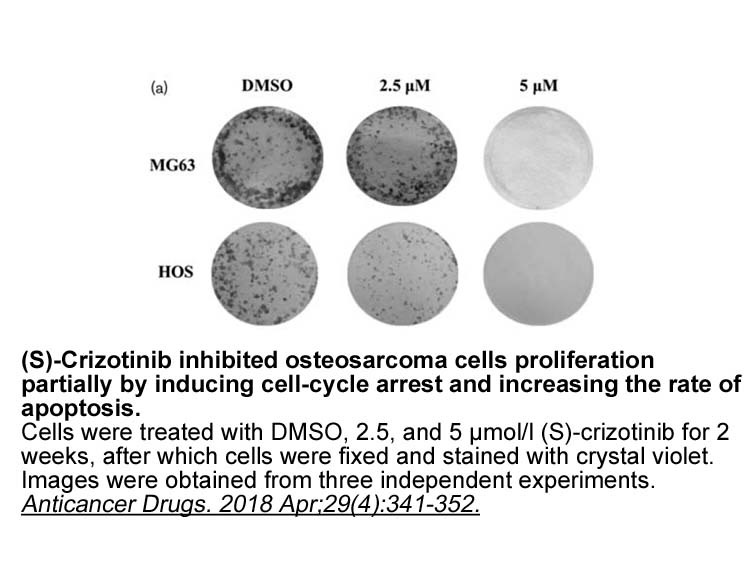 (S)-crizotinib induced an increase in DNA single-strand breaks, activated DNA repair in human colon carcinoma cells, and effectively suppressed tumour growth in animal models as a result of disruption of nucleotide pool homeostasis via MTH1 inhibition. In vivo mouse xenograft studies showed (S)-crizotinib, but not the (R)-enantiomer, was able to impair overall tumour progression aswell as specifically reduce tumour volume by more than 50%.